Long before she made her first trip to Afghanistan as an embedded reporter for The Globe and Mail, Christie Blatchford was already one of Canada's most respected and eagerly read journalists. Her vivid prose, her unmistakable voice, her ability to connect emotionally with her subjects and readers, her hard-won and hard-nosed skills as a reporter had already established her as a household name. But with her many reports from Afghanistan, and in dozens of interviews with the returned members of the 1st Battalion, Princess Patricia's Canadian Light Infantry and others back at home, she found the subject she was born to tackle. Her reporting of the conflict and her deeply empathetic observations of the men and women who wear the maple leaf are words for the ages, fit to stand alongside the nation's best writing on war. It is a testament to Christie Blatchford's skills and integrity that along with the admiration of her readers, she won the respect and trust of the soldiers. They share breathtakingly honest accounts of their desire to serve, their willingness to confront fear and danger in the battlefield, their loyalty towards each other and the heartbreak occasioned by the loss of one of their own. Grounded in insights gained over the course of three trips to Afghanistan in 2006, and drawing on hundreds of hours of interviews not only with the servicemen and -women with whom she shared so much, but with their commanders and family members as well, Christie Blatchford creates a detailed, complex and deeply affecting picture of military life in the 21st century. ©2008 Christie Blatchford (P)2011 Audible, Inc.
Reading about people you know and heard partial stories about and then learning the whole story is great. It puts realism to those who paid the ultimate price. Looking forward to hearing but again. Loved it! It is too bad that a Canadian who knows proper pronunciation of a lot of the words was not used. My only fault of the book. I am an American, but had serviced in the Canadian Navy back in the 1950's so I was interested in reading about the new Canadian military service. I had heard that Canada had combined all the military service and then proceed to almost destroy the military I was curious to learn how much of that was true. 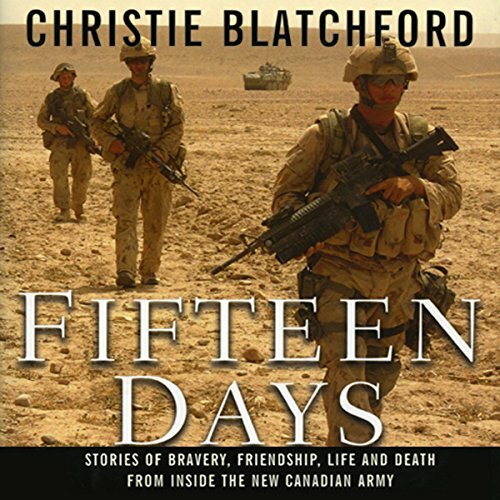 The author, Christie Blatchford was an embedded reporter for the Toronto Globe and Mail with the 1st Battalion Princess Patricia's Canadian light Infantry out of Edmonton Alberta. Afghanistan is the first time the Canadian Military was in Combat since the Korean war, and from what I have learned in this book and from other sources Canada has up held the proud history it acquired in WWI and WWII. The story covers 15 days only of the year (2006) deployment and is told from the story of the menand women involved in each of the action. Telling the personal story of each of the soldiers that died and those who won medals of bravery. It also tells the story of the first Canadian women killed in combat. This book provides an excellent insight into what really is happening with the type of warfare taking place in Afghanistan. The constant fear of stepping or driving over a bomb as well as car or people as suicide bombers. The slow changes made in helping the people and the role the Canadian military plays in helping the medical care and education for the people and children of Afghanistan. This book is a must read to understand what the military (NATO) faces in Afghanistan. The American press give very little coverage to the role and deaths of our allies serving beside us in Afghanistan this book demonstrates that other countries also have grieving families from this war. Most certainly. Audio or printed, every Canadian should know what our troops went through as directed by our Government which, by extention, is what we asked of them. There are no "characters" as this is a non-fiction work. What three words best describe Matilda Novak’s performance? THe narrator, when not trying to emulate the male voice, was quite good. The author started off with a preface on how she struggled to organize the book. And I think it shows. - The book has lots of characters. This by itself does not make it bad. But without much thought being paid to organizing them... it can get confusing very quickly. - The book is basically a collection of stories (or vignettes). Unfortunately the author did not provide a lot of hints when she switches between them. So one finds oneself following one story and then it switches without much warning. - Last bad part is the fact that the perspective of the story telling changes between the author and the characters being portrayed. One may be listening to one of the solders speaking in the first person; and then abruptly it switched to the author speaking in the first person. It may be easier to follow in print, but in the audio, it just changes. - First is the narration... the narrator is quite good. And it is thanks to her that I sometimes can catch the switching between perspective. Otherwise I could have gone for 'pages' between I noticed it. - The story is actually good. It puts a human dimension to the war... especially when the families of the soldiers are being profiled. It reminds all of us that the toll goes beyond the soldiers. Their families also made sacrifices in the war. - Finally, as a Canadian, I definitely appreciate a perspective that speaks to our soldiers, and how they contributed to the effort on all of our behalf. Like the author's newspaper columns, this book is extremely well-written and interesting. It often differs from the usual politically correct CBC-approved stuff that we've become used to in Canada. In general it's totally non-critical of the soldiers, which is fine because anybody who went into that hell-hole is a hero. It's interesting to get a Canadian Army perspective--we probably know much less about our own army than about the U.S. forces. It's puzzling that the author and/or the publisher chose this terrible narrator though. You'd think they might have bothered to get somebody who grew up in Canada so would know how to pronounce words like "Regina", "Loblaws", or "Lieutenant".